This is the debut album by the Avant-Garde Polish Jazz / Improvised Music duo comprising of trumpeter Wojciech JachnaFind albums by this artist and accordionist Zbigniew ChojnackiFind albums by this artist, two of the most interesting musical discoveries in the last two decades on the burgeoning local scene. 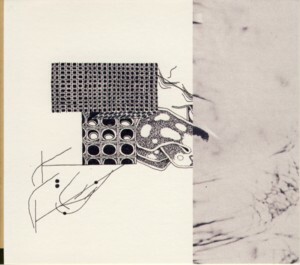 The album presents seven improvised pieces, not credited on the minimalistic album´s artwork, and assumed being co-composed by both musicians, as usual in such circumstances. Although both players use electronics to enhance and expand the sonic capabilities of their instruments, the music is mostly acoustic, especially as far as the trumpet parts are concerned. As a result this album features Jachna more immediately and practically "naked" than most of his numerous other recordings, which of course is a splendid opportunity to get exposed to his virtuosic abilities. Chojnacki provides more of the ambient background and space layer of this music, soloing less prominently here, but his contributions are as much important for the overall result as are Jachna´s. During last year´s Singer Jazz Festival (2017) I invited Chojnacki to play a solo accordion concert on the intimate "small scene" of the Kwadrat Theatre. He arrived armed with his accordion, hooked up to a plethora of electronic devices and played an out of this world non-stop concert with the intensity of an interstellar journey. Of the hundred people who arrived for the concert about half left while he was playing, obviously dazed and confused by what they heard, but those who lasted till the end enjoyed a mind-blowing experience. In my closing statement I told the remaining audience that the fact that so many people left is the best possible proof of how superb the music was. Great music is definitely not for everybody and many sublime musicians were exposed to similar experiences at the early stages of their careers, before their fame became more important than their Art.